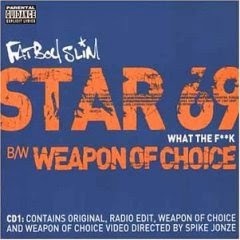 "Star 69" and "Weapon of Choice" are two songs by English big beat musician Fatboy Slim, released as a double A-side single from his third studio album, Halfway Between the Gutter and the Stars. 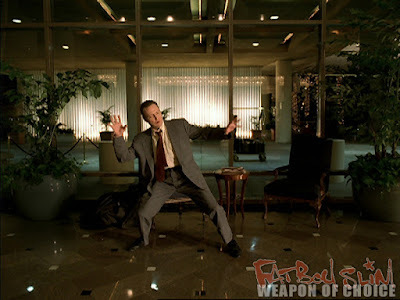 The song is perhaps best known for its accompanying music video, which was filmed in the lobby of the Marriott Hotel (now the LA Hotel) in Los Angeles in December 2000. Directed by Spike Jonze and featuring actor Christopher Walken, who trained as a dancer in musical theatre before his acting career, it features Walken dancing and flying around in the empty hotel to the music. The "Weapon of Choice" video won six awards at the 2001 MTV Video Music Awards. Walken was awarded one of MTV's "Moonmen" for Best Choreography. The clip was also ranked number one in a list of the top 100 videos of all time by VH1 in April 2002 that was compiled from a music industry survey. The Swedish actor Mikael Persbrandt has also danced in a version of the music video that was directed by Malik Bendjelloul. In 2012, British comedian and presenter Rowland Rivron also won charity TV show Let's Dance for Sport Relief with his reenactment of the video's choreography. Mikael Persbrandt dances to "Weapon of Choice" in Berns in Stockholm. Directed by Malik Bendjelloul. Rowland Rivron Dances Fatboy Slim's 'Weapon of Choice' for the Sport Relief 2012 final. Norman Quentin Cook (born Quentin Leo Cook on 16 July 1963), also known by his stage name Fatboy Slim, is an English DJ, musician, rapper, and record producer. As a solo electronic act, he has won ten MTV Video Music Awards and two Brit Awards. His records as Fatboy Slim also helped to popularise the big beat genre, which achieved mainstream popularity in the 1990s.